A small group of foreign nationals residing in South Africa picketed outside Durban’s City Hall on Saturday to protest against the Zimbabwe government’s crackdown and Internet shutdown in the country. 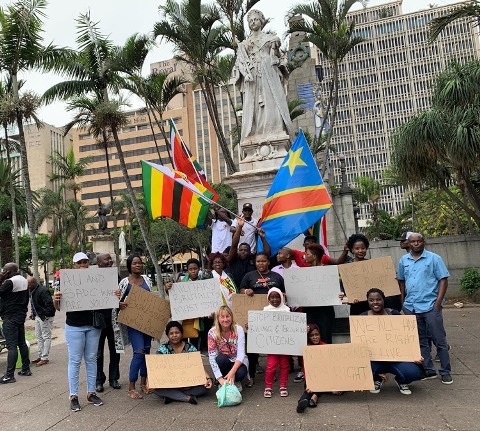 South Africa-based civil group, African Solidarity Network (Asonet), organised the picketing in a show of solidarity with fellow foreign nationals from Zimbabwe at the city hall. The group, which included people from the Democratic Republic of Congo, Zimbabwe and Burundi, also called on the South African government to "stand firm" and to place "maximum political pressure" on Harare. Zimbabwe President Emmerson Mnangagwa’s recent announcement of a 200% fuel hike to US$3.31 per litre sparked widespread protests. The government has responded by deploying the military and police to contain the situation, and in addition shut down the Internet. According to press reports, so far at least five people have been killed and several hundred injured during the weeklong fuel hike protests in the main cities of the capital Harare and the second city of Bulawayo.